Welcome to Literacy 2.0, all things learning! Come learn and collaborate! Are we teaching the right skills? I hold a high school degree, a Bachelor's degree, a Master's Degree, and a Specialist's degree. I hold countless certifications. On paper, I meet the educational requirements of most jobs I desire. However, that assumes that those degrees and certifications are teaching the skills the job needs. I have been out of the classroom for six years now, but this year, I'm going back. I'll be teaching high school English again in addition to a cutting-edge, Makerspace course at a college preparatory 6-12 grade school. As I prepare to teach ninth grade English, I'm reminiscent of my own schooling. On paper, these students meet the requirements of most major colleges. In the classroom, they excel. Yet, we continue to have thousands and thousands of jobs in the U.S. that our students are not qualified to fill. And, it isn't because their paper resumes don't fit. It's because they lack the actual skills to do the job. I read an article in the Harvard Business Review recently about the skills gap that I've become familiar with. In the graphic design industry, schools teach the current skills necessary to be successful on the job. They don't teach the "future" skills because they don't know them. However, we shouldn't focus on the actual content skill, but the learning skill necessary to be a successful employee. Why don't we focus on teaching students how to "learn on the job," how to search and evaluate? We need to redefine the skills we want students to learn. The major skills employers say students lack? Soft skills. Yes, soft skills, followed by leadership and computing skills. It's a way of thinking. It's a way of innovating. As I prepare to teach The Odyssey to freshmen in a pre-made curriculum, I question what skills we are engineering in students. What is the end goal? What job do we hope this will prepare them for? Check out this school that is functioning as a business. Students leave with skills - of all kinds - to start work. I don't think the education system has failed. I refuse to call it a failure. But, I don't think it's working as well as it needs to be. It's time to step back and assess where are our jobs? What skills are our students lacking? Do we all need to go to a four-year university? Do all jobs require a four-year university? Is there anything wrong with going to technical school instead of a four-year university? Right now, I hear speeches on making college free for all, but nothing to change the effectiveness of college. If you went to college, did the four-year university prepare you more for your job than a technical school would have? Where did you learn most? For me, it was on the job. I loved my time at college, but I'm the first to admit that it could have been done in less time (and I even got out in half the time) with more time spent tinkering, exploring, innovating. What do we need more of in this world? What problems do we need to solve? That's what we want to teach. Jobs are changing fast. I feel it is impossible to keep up with the content changes. But, it is possible to keep up with the learning changes. It is possible to recognize that our students need to learn differently to be successful. Imagine a world where we could fill the jobs that are open. Imagine the economic boost. Imagine the impact it would have on families, on innovation, on communities. Education won't solve it all, but it is certainly a great starting place. Thanks to my co-worker, Brian Gray, we have the new Google Sites on our school domain. Over the past month, I've had the opportunity to test it out and rebuild some of my old sites in the new version. While the new version still lacks some necessary features like being able to hide pages from the navigation bar (but still have them visible), remove header slots, control width of site, and control some of the font colors (limited options), the simplistic design is ideal for teachers. In fact, I would not want too many options. The more options, the more room for "ugly" Sites and...who wants that? With the new Google Sites, you are guaranteed to have a more professional looking site. I plan on updating my fennovation.org Google Sites resources as I find more ways to customize your Sites (beyond the how-tos out there currently). In the meantime, check out the new version or our digital citizenship site as compared to the traditional Google Sites version. I used Canva to create a header (public version so you can make a copy and edit it). I also used Canva to create circle icons on some of the pages (public version so you can make a copy and edit it). 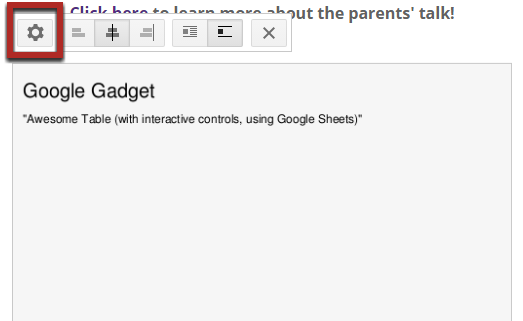 And, because the Awesome table folks are so awesome, they have made Awesome tables accessible on the New Google Sites! To use it, you can still create an existing Awesome Table (see my previous blog). Once you have created one, you can see your creations from Awesome Tables. Since I already had them in my existing site, I was able to go to the old site and go to editing mode. Then, I clicked on the Awesome Table & the gear. From that menu, I clicked on the table name. Then, I changed the URL from "edit" to "view." Next, I copied that URL. Then, I went to the New Google Sites and, under "insert," I clicked on "embed URL." I pasted the link in the box and pressed "Apply." Finally, I resized the table to fit my Site. And, that's it! You can click on the preview button at any time to view the preview version of your site. When you are ready to go, just press "Publish." FYI - if you go back and edit your Site, you will need to press "Publish" for your changes to be live. Stay tuned for more detailed presentations to come. 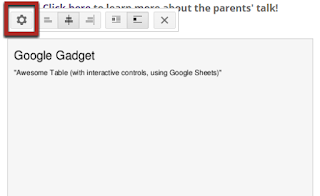 In the meantime, try playing with the New Google Sites! A year ago, I left my job in public school to enter the private sector. I did not know then how different and difficult my year would be. Due to those difficulties, I made a commitment to myself to write a review of my year to better reflect on my accomplishments and struggles and to help those in a similar situation. This past school year, I found myself on the verge or at burn-out levels multiple times. And, I'll admit, I still struggle despite it being summer. I found myself questioning my effectiveness; questioning my job. Have you felt that way before? I found myself at levels of disappointment I had not felt since my first year of teaching. That's when I realized this was my first year. Though I had more years of experience behind me, this was a new phase. This was a transition. I had taken a leap and now, I was finding my footing. I am still finding my footing. We are all still finding our footing. And, if you have found it, it's time to take another leap. It's that point of frustration we want to keep our learning an our students' learning at - that point where you want to quit, but you won't because you want to see through the journey. In a classroom, we support our students through this. Professionally, it can be isolating. This was my struggle. And, unfortunately, I didn't realize it until the year was nearly over. So, my goal for 2016-2017 - keep my network of support close. Don't pull the weight on your own. I spent a lot of time alone, planning. I did not spend time collaborating. I need collaboration. Again, don't isolate yourself. Reach out. Don't be shy. In my time alone, I had plenty of time to dwell on what wasn't happening. When things are moving fast, there is little time to focus on the negative and only time to embrace the movement. So, take breaks. Write down your accomplishments. Make note of your successes. And, when all else fails, get up and take a quick walk. Rinse and repeat. I found myself becoming negative and uninspired. At this moment, take a break and create. Create, create, and create. It will instantly boost your inspiration. And, you might discover a new idea to implement. I have plenty of fears for this next year, plenty of challenges, and, hopefully, plenty of positive moments. Next year, I'll be teaching freshmen English again for the first time in six years and a makerspace course - the first of its kind at my school. I'll also be continuing my normal job as a technology integration coordinator. My work is cut out for me. I'm excited for the busyness. I'm also nervous and anxious, much like our students are. This school year, I am going to blog more about my daily experiences rather than just my successes. Writing is therapy. Sharing is therapy. Sharing leads to collaboration and networking. This year, I started a digital citizenship team that led chapels, parent discussions, and student panels. I also created a makerspace course and helped set up three smaller ones around campus. I also created an infrastructure for change. It's the last point that is hard to see and believe. I still don't fully believe it. I'm sure many of us have been here before. This year was nothing short of a challenge. And, I won't sugar coat my experiences. However, I won't let them define me, my job, my school, or my work. Rather, when the challenges get heavier, I will write more and share more. We are connected. Share your experiences and grow. What were your experiences this school year? What will you do next school year? What advice do you have to share? Christy Fennewald, 2012. Simple theme. Theme images by hdoddema. Powered by Blogger.